Condition: Some wear in field, and some minor damage to sides. Notes: Classic Aimaq 'latch-hook' or owzi ('water-like' in Farsi) medallions in a variety of colours. Soft, oily handspun wool lends a glistening vibrancy. The Chadar Aimaq include people of Turkic, Persian, Mongol and Arab extraction. 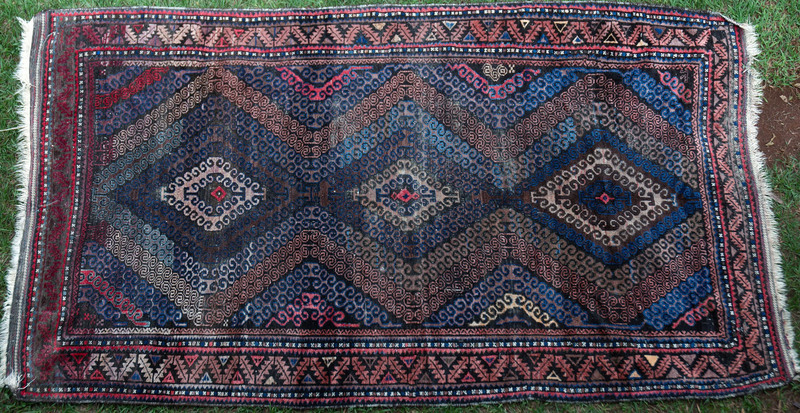 It is possible that this rug was woven by similar groups across the current border, in Persian Khorrassan, or indeed further south in Herat Province, as this design is also woven around Adraskhan.